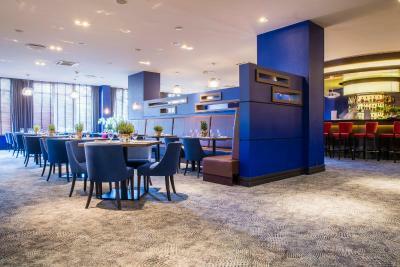 Lock in a great price for Radisson Blu Sobieski – rated 8.4 by recent guests! The breakfast is the best breakfast I have ever seen in a hotel. The buffet breakfast was ok. Selections were kind of limited. But, had the basic selections for most European travelers. The price is reasonable and the rooms are exceptable. The breakfast was excellent! Service and location are great too. The facilities were great and the room and the bathroom were super clean. The bed was super comfortable and the staff were very professional and friendly. Location, Trylogia Restaurant and Bar. Great service Piotr, Jarek, Michał, Andrzej and Victoria all were nice and very helpful. Upon request the room was ready earlier and check-in literally took 1-2 minutes. Rooms are nice and clean, with good breakfast buffet and also rather good gym and steam sauna is available. Cookies on reception are realy great, also atrium was impresive when i také a look from window, breakfast also great! I can only share my very positive review regarding Radisson Hotel Blu Sobieski. We arrived quite early to Warsaw for a weekend trip and the very nice receptionist allowed us already to check in and accommodate ourselves. This was a very good first impression about quality of services at this hotel. Rooms are well equipped and clean. Wifi has a strong and stable signal. The breakfast menu is rich and exclusive, already almost like in 5 star hotels. Location of the hotel is excellent. All in all we can only recommend the hotel for any kind of stay at Warsaw. The property was conveniently located and near public transportation. 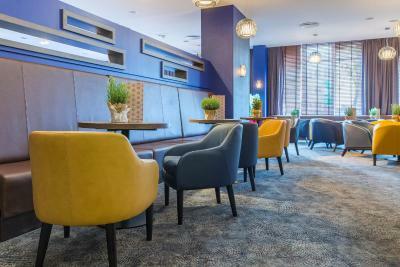 Radisson Blu Sobieski This rating is a reflection of how the property compares to the industry standard when it comes to price, facilities and services available. It's based on a self-evaluation by the property. Use this rating to help choose your stay! One of our top picks in Warsaw.Radisson Blu Sobieski is a luxurious, nonsmoking hotel in the center of Warsaw. It offers elegant rooms, excellent cuisine and leisure facilities. Free Wi-Fi is available. This 4-star property features well air-conditioned rooms with soundproofing, an LCD satellite TV and a mini-bar. The apartments also have a living room with a sofa and a work desk. The private bathroom comes with a shower or a bath. 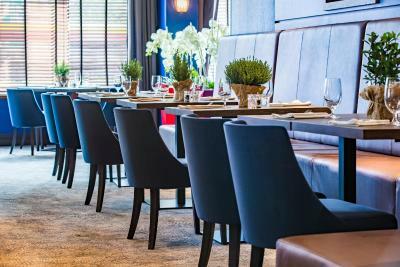 At the hotel there are 2 excellent restaurants, Marysieńka and Trylogia, serving delicious Polish and international dishes. 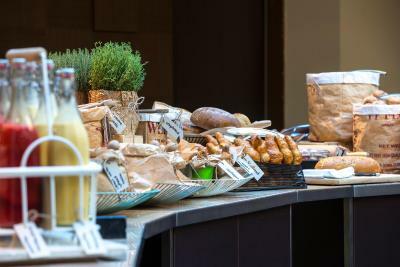 Trademark Super Breakfast Buffet features an array of bread, fruit, cold cuts and hot dishes, including allergy-friendly options. 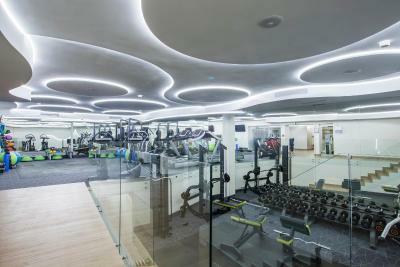 Radisson Blu Sobieski Hotel offers its guests a totally new wellness experience in an upgraded and fully refurbished SPA and Fitness Center with an area for cardio and weight training and a steam sauna, as well as personal trainings and spa treatments upon request. Hotel staff can help with organizing tickets and tours. The Warszawa Centralna Railway Station is located just 0.6 mi away, whereas Warsaw Chopin International Airport is 4.1 mi away. It is 1.1 mi from the Palace of Culture and Science. Ochota is a great choice for travelers interested in shopping, sightseeing and museums. When would you like to stay at Radisson Blu Sobieski? This double room features a city or a garden view, free WiFi, free newspapers and magazines available via the One Touch App, coffee and tea making facilities, an iron and ironing board, as well as air-conditioning and an LCD TV with satellite channels. Private parking is available on site (reservation is not needed) and costs PLN 90 per day. This spacious, air-conditioned room is located on a high floor and offers an amazing garden or city view. It features free WiFi, free newspapers and magazines available via the One Touch App, 1 free bottle of water per room per night, a bathrobe and slippers, as well as a mini-bar, a kettle and air-conditioning. Turn-down service is available on request. This spacious air-conditioned suite features free WiFi, separated sleeping and living area, free newspapers and magazines available via the One Touch App, 1 free bottle of water per room per night, turn-down service on request, a Nespresso® coffee machine, as well as a bathrobe and slippers. This cozy double room features free WiFi, free newspapers and magazines available via the One Touch App, coffee and tea making facilities, iron and ironing board, as well as an electric kettle, mini-bar and air conditioning. This spacious air-conditioned family room features free WiFi, separated sleeping and living area, a kind size bed, a sofa bed, free newspapers and magazines available via the One Touch App, 1 free bottle of water per room per night, turn-down service on request, a Nespresso® coffee machine, as well as two flat-screen TVs, a bathrobe and slippers. This superior double room features a city or a garden view, free WiFi, free newspapers and magazines available via the One Touch App, 1 free bottle of water per room per night, a bathrobe and slippers, as well as a mini-bar, a kettle and air-conditioning. Hotel surroundings – This neighborhood is a great choice for travelers interested in shopping, sightseeing and museums – Check location Great location - show map Guests loved walking around the neighborhood! 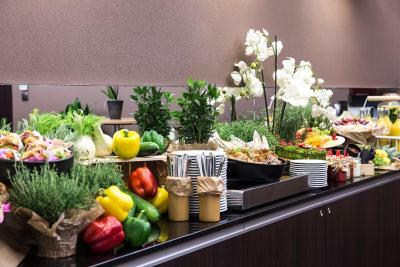 House Rules Radisson Blu Sobieski takes special requests – add in the next step! All children under 12 years are charged PLN 162 per night for extra beds. Any additional older children or adults are charged PLN 162 per night for extra beds. Radisson Blu Sobieski accepts these cards and reserves the right to temporarily hold an amount prior to arrival. For nonrefundable reservations, guests are required to show a credit card upon check-in. In case of bookings on behalf of a third party, please contact the hotel in advance. Please note that the there is a construction site next to the property until the autumn of 2018 and therefore noise disturbance may occur. A modern hotel, great stuff polite and ready to help, very good breakfast. The Spa wasn't of the same standard as the rest of the hotel, the breakfast offering was ok but you get better at other Warsaw hotels. Room was great, customer service also really good, excellent location. Food in the dinner restaurant was also really good. It is very easy to hear everything going on in the next rooms. Good location, great staff, good wifi and excellent breakfast! The overall experiance :) it really was a nice stay. There was no milk provided for morning coffee. We had to buy our own. Fantastic view over Plac Zawiszy. Friendly and helpful staff. 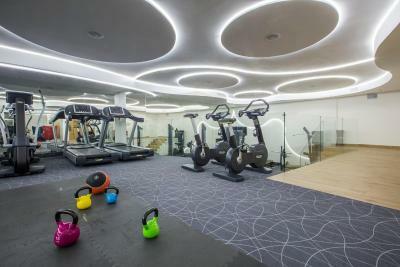 Great fitness centre. Tram station right in front of hotel. Close to shops. Nice restaurants close by. Good breakfast selection. Breakfast was great! So much choice!